June 22, 2018 — Comments are off for this post. To breathe new life into the brick-and-mortar experience, retailers are turning to one key ingredient: their consumers. Taking their shoppers’ needs and behaviors seriously and incorporating them into every touchpoint in customers’ visits, brands are reinventing the store as we know it, driving sales and interest using interactive and immersive technologies, displays and capabilities to integrate the best of digital and physical shopping into one enjoyable and efficient service. Nike has been pioneering the new face of IRL retail, and the athletic retailer’s recently opened Nike by Melrose store is no exception: Described as a “neighborhood digital service hub,” the store is built on data and driven by digital, embodying the Nike Live concept in subtle and effective ways. PSFK founder Piers Fawkes spoke to Nike Direct President Heidi O’Neill to understand how this concept store was built by and for the people of L.A.’s Melrose neighborhood, catering to their lifestyles and tastes, as well as its mission to synthesize the best of digital and physical, implementing connected options like at-home reserve for in-store trial and even boasting an expert-staffed Sneaker Bar. Piers: What are the broad trends that Nike is trying to leverage today? Heidi: What we’re seeing is that consumers are really fluid in their shopping and activity experiences. There’s a level of fluidity between an in‑store experience, an online experience and an app experience. More than anything, we want to respect those consumer journeys that are incredibly organic. 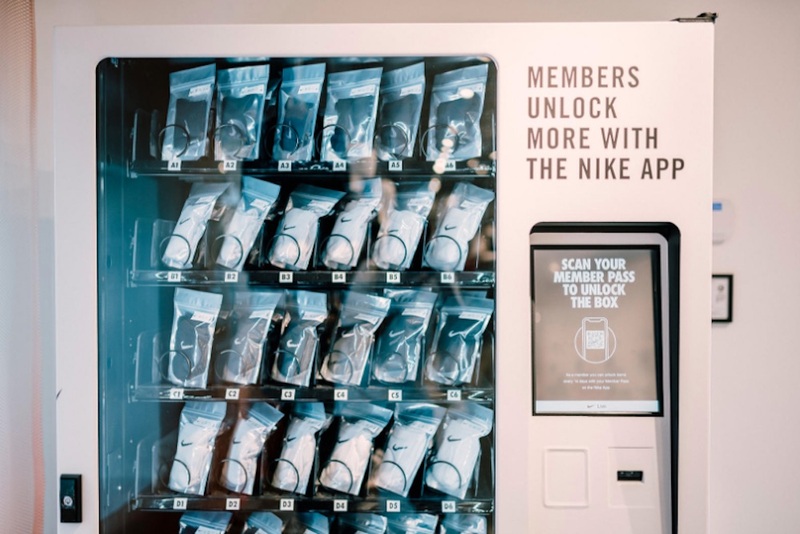 We don’t see consumers putting up walls between physical and digital in their workout activity or in their shopping activity, so we hope the launch of this concept (along with our apps and a combination of physical and digital experience) is an answer to the way consumers are interacting with Nike. We have always believed in activity and inspiring consumers. We want to always do that in a human and personal way, but we want to be able to also do that at scale. Over the last few years, retailers and brands have become concerned about changes in how consumers interact with and purchase from them. Did Nike have to reinvent the purchase path completely, or have elements remained? I think as much as things have changed, there’s so much that stays the same. Customers need to be inspired. They need to take a look around. They need to browse and try on. They need to think about it. All these are steps in the journey. We’re seeing an incredible back and forth between the online and offline. It also doesn’t happen in one-stop, or in a 24‑hour period. As a consumer, I start my inspiration online. I do some shopping in the store, and I end up back online, and maybe back in the store for some advice. As much as we speak to challenges with physical retail, we still see that, at some point in the journey, at least 80% of our purchases had a moment that involved a physical connection with the brand. We’re really trying to listen to the voices of the consumer, respect that journey, and respect it in a modern way, but still realize that the same process that has been tested in time is still so. The Nike Live experience that you’ve rolled out for the first time in Los Angeles is called Nike by Melrose. How does it connect with the trends we’ve been talking about? We’re moving the passion around innovation that we have at Nike to retail innovation. Nike by Melrose is retail in a way that we’ve never done before. We see it first and foremost as a neighborhood digital service hub. It really was built for and inspired by our members. We looked at our members’ patterns in the Los Angeles Melrose neighborhood, and really watched behavior and listened to voices around engagement, activity and what they needed from Nike. We built the store from choice of site to the assortment and to the services offered in the store based on what we were hearing and learning from our members. We’re leveraging their activity engagement data that we have through our apps and nike.com and having conversations with them. One of the most important things we heard from our members is that they love Nike. Our engagement and activity with members in the ZIP code surrounding that door was up 48% from last year. This is telling us that the Melrose neighborhood loves Nike. And Nike loves Melrose. So we asked ourselves, what can we do to bring a speed and convenience experience to service those members that are in that neighborhood? That’s where the idea came from. It started with serving our members better and powering that experience through data and insight. It’s interesting that you’re using the word ‘member’ rather than ‘customer’—why is that? Many people would love to be treated and experience life as a Nike elite athlete. What we do for our members at Nike is that we try to treat our members like our world’s best athletes. We gear them up with our innovative products. We give them access to expertise and coaching. We’re trying to bring that level of personal service that really has been the Nike ethos from day one to every member. When we have a digital connection, it allows us to do that at scale in a way we never have before. Of course, we’re talking about every athlete—whether you want to break two in marathon, or break a sweat. How does this strategy manifest at Nike Live? We started first with, How can we better serve? What products do our consumers want? What services do they need? Then we powered feedback with data and tech. We didn’t lead with data and tech. We led with service to consumers. The components of the store walk that line from human to digital. It’s definitely not a store where you would see tech shouting at you. You would see people and tech better serving you—just the right feel. Tell me about how Nike tailored its product selection. First of all, what we did is look at what was trending from a product perspective, and what activities that our L.A. consumers and members were most invested in. We saw that in Los Angeles—these wouldn’t surprise you, the data doesn’t lie—they’re running fast, they love style and they really push the style—that is, more so than some other pockets of members. For them, our basketball style is best. We built the store from bottom up with that information. In the back of the store, you would see L.A.’s favorite product. What are they buying day in and day out? You’ll see that product supported by information directly from our consumers and their voices. You’ll see LA’s favorite hoodie, and it will be called out just as that. You’ll see women’s number-one-purchased tight, number‑one re‑purchased tight. You’re really using the voices of consumers to assort the store, and then to help communicate what is special about the product. Then as customers move toward the front of the store, the experience will get increasingly new and fresh, all the way to the very front of the store, where they’ll see the exclusives for Nike at Melrose that are built around ideas and concepts that we think our Melrose members would love the most. What are some of the new services offered? One of the boldest moments in the store, I would say, in our Nike sneaker bar, which we see as a new level of service and speed for footwear shopping. I absolutely believe that if anyone’s going to reinvent a new level of service and speed in footwear shopping, it better be Nike. It’s a beautiful sneaker bar with sneakers right there, with the inventory right there on the floor. 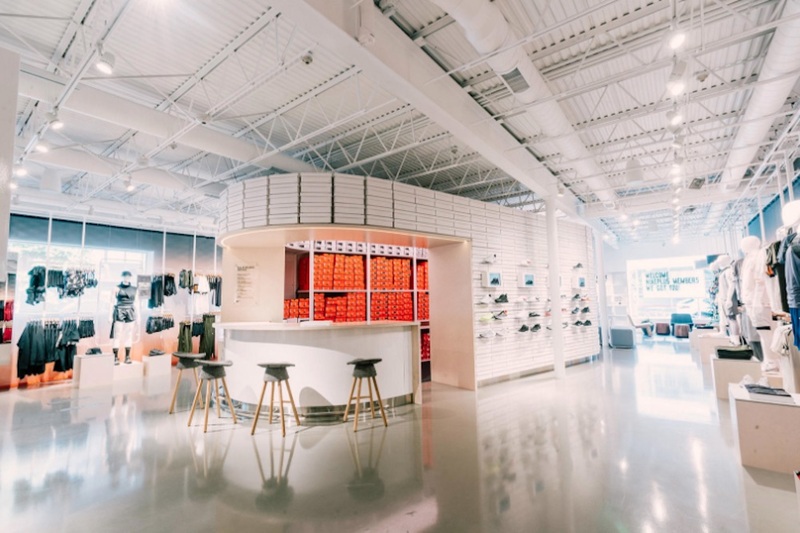 A Nike expert is there who’s been trained with depth around all of our footwear stores, but then there’s also the experience where, with their Nike app at retail, customers can actually scan the product at the footwear wall themselves, and learn a little more. Customers have that choice, to have a moment to just explore and learn on their own, or to have a really deep Nike expert service at the sneaker bar. Our prediction is that we’ve probably cut down the time to try and buy by a good 5 to 10 minutes with this experience, and made it very Nike along the way. I think that’s one of the moments of the store that is important, and a great demonstration of physical and digital. How does the digital merge with the physical with Nike Live? With Nike by Melrose, we’re bringing to life our Nike app at retail. It’s a perfect shopping companion, as we see it. There’s a few great experiences that our members can enjoy if they want to have a connected experience while they’re in the store. One of those is a reserve feature. Our members can reserve products from home. Maybe their journey started in my home, and then they reserve it at the store door. They can come in and try on, or complete their purchase at the store. Then to add an extra Nike twist to that, we’ve built lockers in the store. If customers want to just go straight to purchase, they can bring their app in and scan their pass at the locker. It’s a magical moment: The locker lights up, pops open and reveals the shoes they reserved the night before. You mean a customer brings their phone, the locker pops open and there’s a sort of ceremony around picking up your purchase? Exactly. Some people will choose to do it that way. One of the things that I pressed really hard in the planning of the store is to make sure we didn’t geek out on tech for tech’s sake. Another option that I think is perfect for L.A. is, if you don’t want to come in—if you just want to come by and purchase—we also have curbside pickup. What I love is that we didn’t forget the human side. We’ve really tried to allow consumers to enjoy the shopping experience on their terms. It sounds like you’ve thought about not only different consumers, but also different consumer mindsets along that purchase path. I think that’s a perfect way to say it. There’s a lot of research in consumer connection going into this. Anytime that we got a little carried away with a singular journey or a singular mindset, we really checked ourselves. Different consumers have different mindsets at different times. Today, I need to be in and out. Tomorrow, I need to find the best running shoe for my partner to surprise them for their birthday. I want to spend time on it, and get it exactly right. I really do think, while the store is built for speed and convenience, and powered by data and tech, that it’s really meant to be experienced at our members’ pace. What does this concept store in Los Angeles mean for Nike and its strategy going forward? We want to learn. We want to honor the idea of Nike Live. The store I was in yesterday will be a different store in two or three weeks, because we’ll be listening to consumers’ voices through data and learnings. One thing I didn’t mention earlier, by the way, is 25% of our footwear wall will change out every two weeks based on that listening. Would that 25% figure hold true across typical Nike stores? I would say in a more typical Nike store, you would see 25 to 30% of the product being changed out about every 60 days. It’s a healthy 3X pace to our change‑out. We’re leveraging connected inventory around our L.A. metropolitan area to make sure we can be responsive to consumers. Then we’re also leveraging some of our Nike speed initiative around product responsiveness to make sure we can get into what consumers are voting for as fast as possible, and have this experience be really a flagship one. It’s a really cool concept. The question is, as Nike becomes a world-class digital commerce retailer, how can we take that prowess and that skill set to a physical shopping experience? We’ve used what it takes to be in that business 24/7, listening and looking at data, seeing what consumers are choosing, and brought that to a store experience. That’s another important ingredient. Finally, what can you tell me about Nike’s future? A couple things: Our next store is planned. As we learn and evolve this Melrose location, we’ll be opening a new door in Japan in Tokyo in the spring. What I like about that is when we build those stores, we can even bring some of what’s trending in Tokyo to Melrose, and what’s trendy in Melrose to Tokyo. We can bring some world trends in and mix it up in those stores. We have a fleet of 7,000 Nike doors in our network. We’ve got great retail partners. Our goal is to start scaling some of these experiences in all of our stores. This fall, we open our new flagship on Fifth Avenue. You will see many of these services and experiences that we’re first launching here at Melrose come to life in New York. You’ll see our Nike app at retail start to spread across the globe very quickly, as we learn from and can scale that experience. 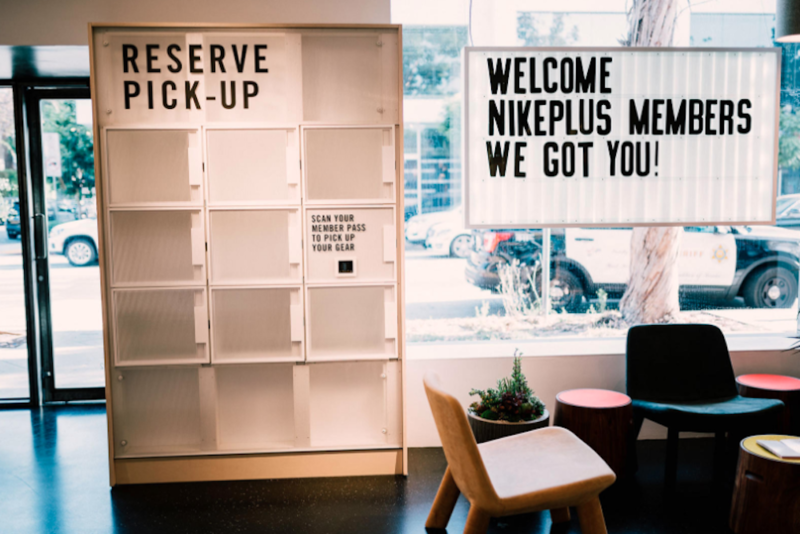 The great thing is, you’ll see more Nike Live concepts, but you’ll also see the ethos and the service mindset that we’re bringing to life here through all of our door concepts, and eventually through some of our partner doors as well.